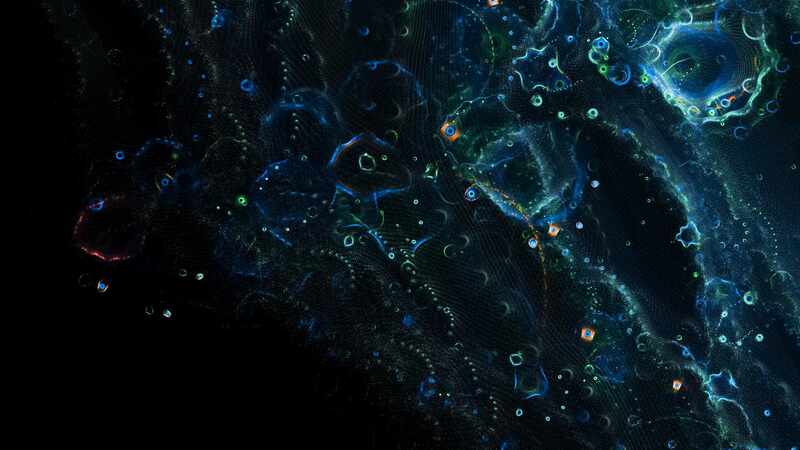 The Most Authoritative List Of Mandelbulb 3D Tutorials On The Internet! As with any skill you wish to master, training is critical. The skills you will acquire by going through the tutorial training listed below will propel you to the Master Level of Fractal Art creation! This collection of training tutorials could easily be sold for a few dollars per pdf, however, I provide it here free of charge so it can help the most people possible! 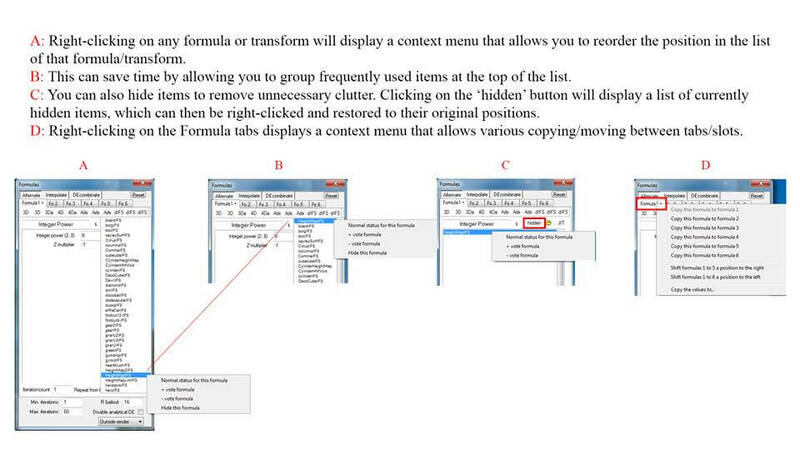 Here is an important tip for new users that may get a “missing formula” error. The first thing you should do is to try downloading the Custom formulas & transforms from this link. 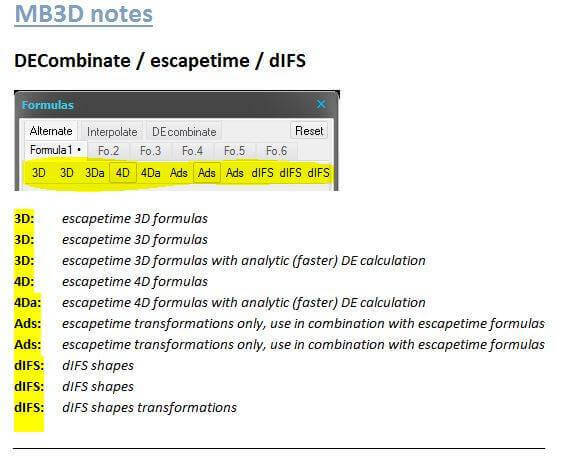 Once you download the zip file, use it to overwrite your existing formulas. Remember that if you get a formula “options not valid” error, it could also be because you are trying to mix formulas from the last three columns with those in the first 8 columns. You can’t do that unless you select DE combinate as a hybrid type. You might be using a formula in the last column without using a shape formula from columns 9 and 10 along with it. Another possibility is that you could be using a formula from the ads columns without also selecting another formula from 3d, 4d or 4da columns to go with it. If you load a set of parameters and you get a missing formula error then you need to get the formula that is missing and add it to your M3Formulas folder and restart the program and then reload it and the formula will be in its respective column. So when you reload the parameters again, it will no longer give you the missing formula error. So that question is answered. If you are getting a formula error from incorrect settings for the DE combinate then once you fix it, it will then say “parameters ok” and it will allow you to finish working on the fractal, if it keeps giving you the error then you didn’t fix the settings. There are a few things that can cause that error so studying the tutorials for DE combinate is the best way to figure out what you did or didn’t do that is causing the error. Now, enjoy the following tutorials. We take a highly visual dive into Fractals — what they are, what they mean and what they reveal to us. It’s an astonishing look into mysterious mathematical riddles that create infinite multi-dimensional worlds with a very sci-fi feel. Here is a video that explains the images above! Start here and try to work through this entire list. If you do so, your skills will almost triple. Some of these are a little dated but the instruction still applies to the current version of Mandelbulb 3D! Mandelbulb 3D ~ Light it up! What is the Deal with Color? 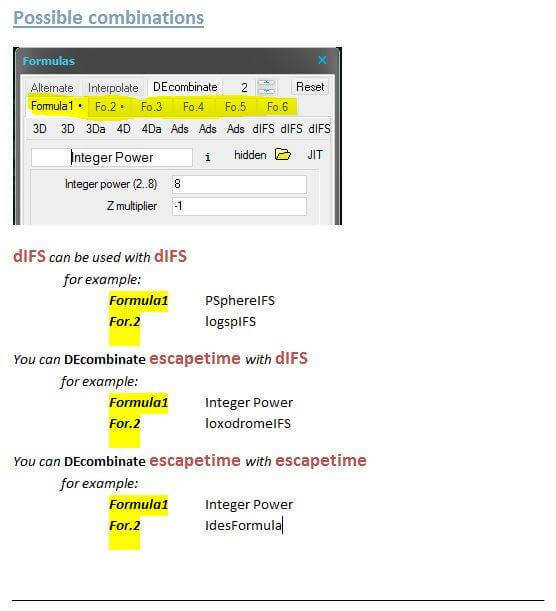 WAY faster gnarl formulas. Sample params. Scappin Matteo has begun a Tutorial Series that will be added here as the newest ones come out! These should be very informative and helpful! Mandelbulb 3D Tutorial + New Style? Final Thoughts About Your Training! If you have written a tutorial, shared a collection of maps or created a parameter pack that is not listed here, please contact me through da and I will be happy to add it. Thank You for taking the time to review this list!